Maple and I stayed at the Amherst Inn on Wednesday night, so we could get off to an early start Thursday morning. The weather was perfect. In the upper 70s, with clear skies. What we were more concerned about was the availability of water on top of The Priest. Maple and I had both made inquiries, and what we were told left us thinking that, to be sure of water, we had to carry it with us. 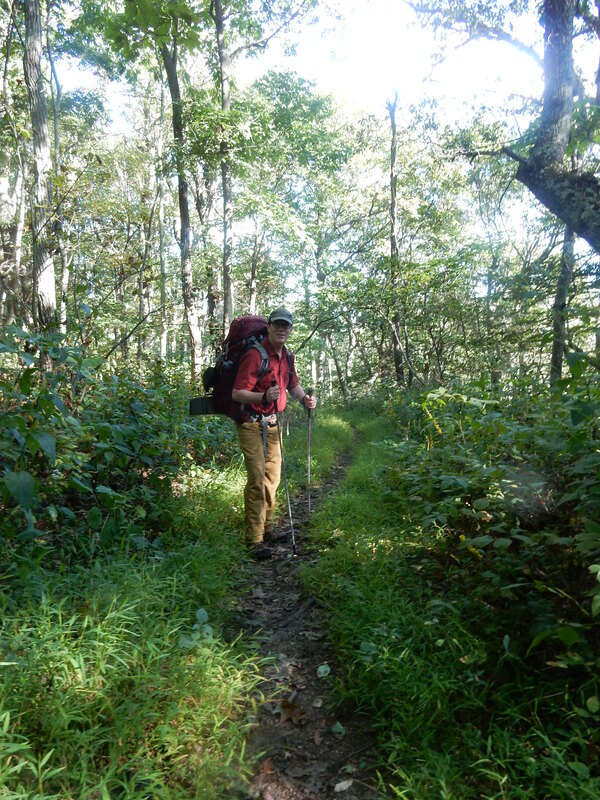 (Thanks Natural Bridge Appalachian Trail Club!) So I packed on an extra 4 liters, and Maple carried an extra 1.75. That, plus four days of food and clothing, made us feel that we were carrying the heaviest packs ever. We stopped to have lunch on some rocks about two-thirds of the way up, at an overlook, and took pictures. A little snake seemed to take an interest in us, and came so close that it peeked up at us from under Maple’s backpack. She screamed and sent the critter scrambling under leaves. From here on the hike seemed to get more difficult. Ultimately, we were pausing every ten to twenty yards to catch our breath. Finally, we reached the top, where, over the rocks to our right, was the last overlook. Maple insisted I check it out, and since it was level ground, I consented. But, I got careless, and my boot got caught on a root, sending me diving face-first into the dirt. In the presence of The Priest, I cursed. I confess I was pissed off at myself, since I had tried so hard to be careful before taking this short detour. F inally, we arrived at The Priest Shelter. There, we found that we had carried the extra water unnecessarily, that the spring was flowing, however so gently. 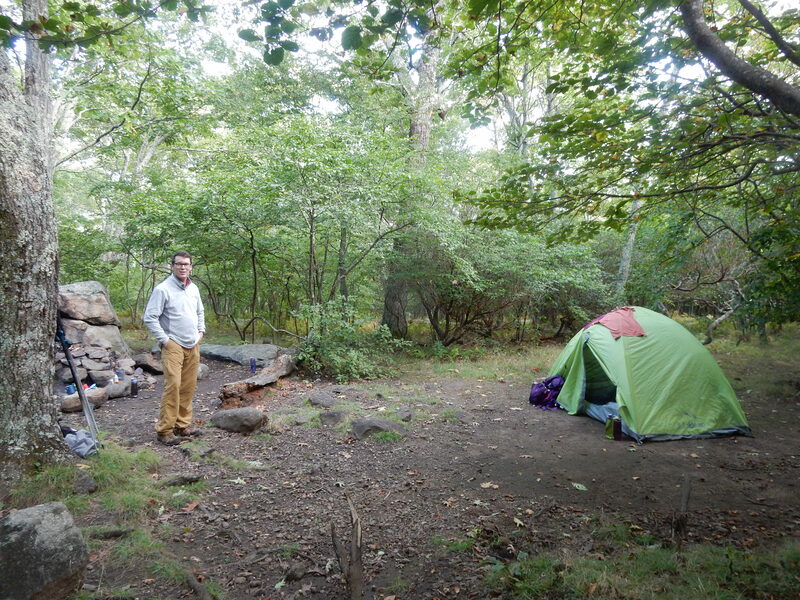 We set up our camp, made coffee, filtered water, and relaxed. After making dinner, we played a game of backgammon, retired, and day one was over. Day two was expected to be an easy, 6.7 mile jaunt. This area was once a logging area, and much of the larger trees were wiped out in the 1930s or so. It did seem like there was more new growth than some areas we’ve hiked before. However, it was beautiful. It was far enough away from main roads to be very quiet and peaceful. The trail descended sharply going south from the Priest. Then, it offered a series of ascents and descents (overall going up about 1,000 ft.) before reading “Spy Rock”. Spy Rock is a very popular day hike. It was fun to see people ooh and aw over our “big” backs. “You are obviously professionals,” someone said. Yeah. Right. We had lunch at Spy Rock but never did get to the top. I’m sure it must be possible but it required a bit too much effort for our liking. Apparently, this was once a great place for the Confederate troops to track the forces from the North. I’ll have to take others’ word for it. In about 2 1/2 miles we reached Seeley-Woodsworth Shelter. It has a tremendous, well-running spring that enabled us to fill up to our heart’s content with water. There, we met “Star Man” and “Fire Starter”, two brothers who valued fellowship over tough hikes. They had skipped the Priest but had experienced other fun adventures on the trail. A surfer/massage therapist/Costa Rican named Todd joined us at the shelter and we had a blast sharing stories. Overall, it was a wonderful day. Home Sweet Home at Seeley! Day three was, potentially, our hardest venture, with 10.2 miles to hike to get to the blue trail leading to the shelter—another .5 miles. It was the furthest we had ever committed ourselves to hiking with full backpacks. Having been previously informed that the spring at Cow Camp Gap was dry, we stashed a water supply off the trail at a clearing two miles north of Cow Camp Gap. So, at least we didn’t have to carry extra water as far as this clearing. 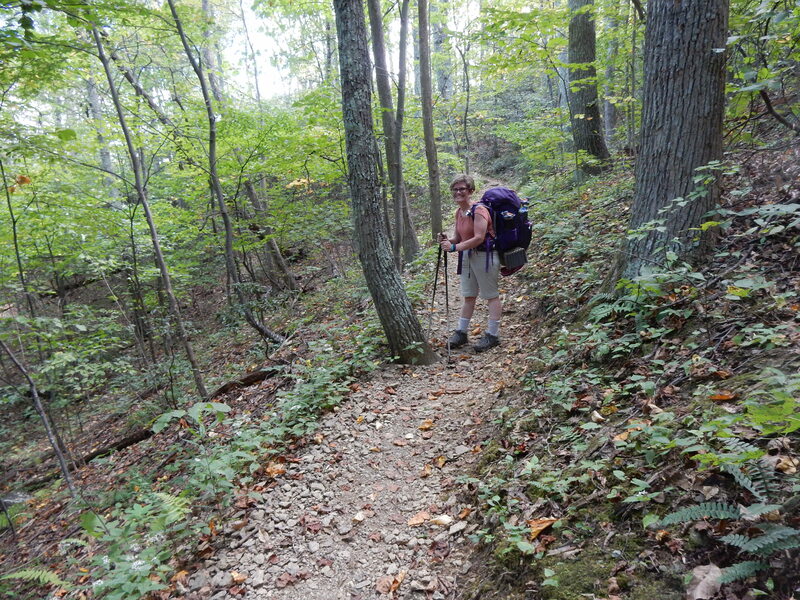 The hiking wasn’t too difficult, and we arrived at Hog Camp Gap at about noon. 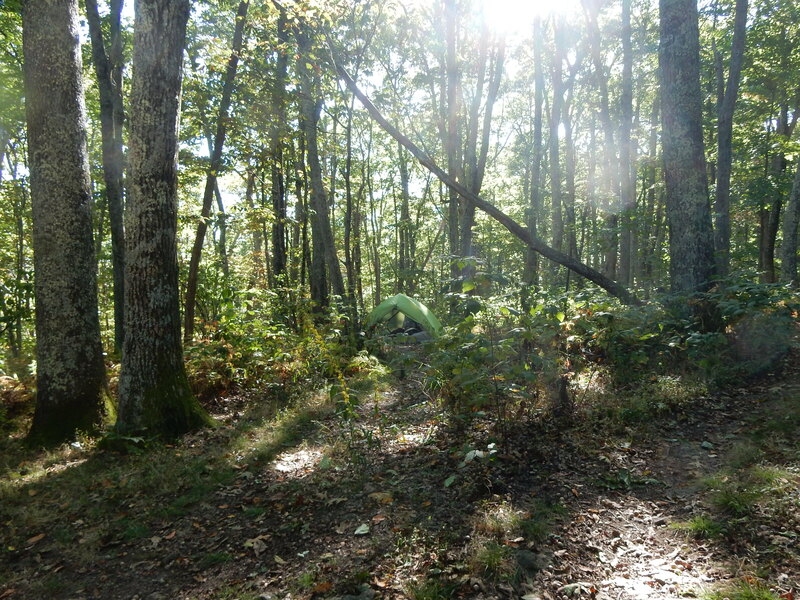 There we rested under apple trees, had an apple with our lunch, and were about to begin our descent up Cole Mountain when I suddenly realized that this was the place that I had stashed water. I hadn’t known exactly where I had stashed water, only that there was a sign indicating that it was two miles before Cow Camp Gap. When I saw the sign, I realized that Hog Camp Gap was the place. 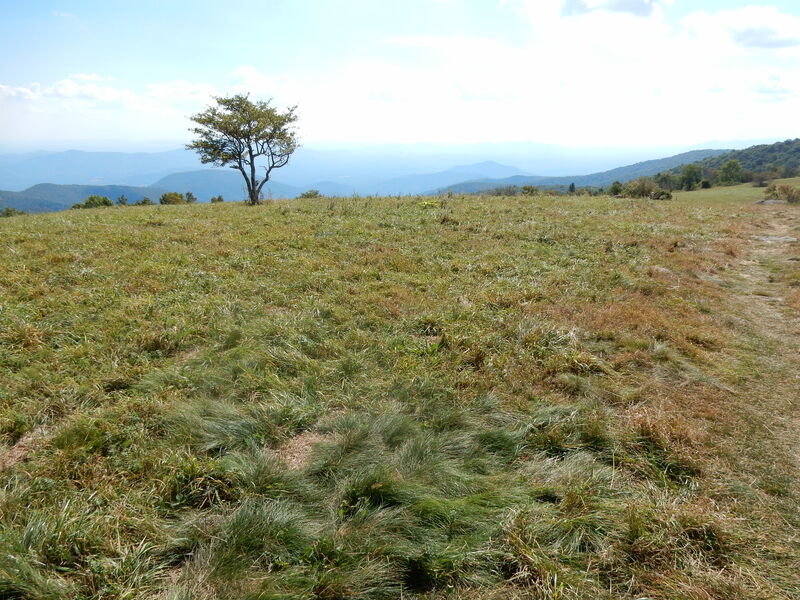 So, we retrieved our water, and with the added weight, climbed Cole Mountain. 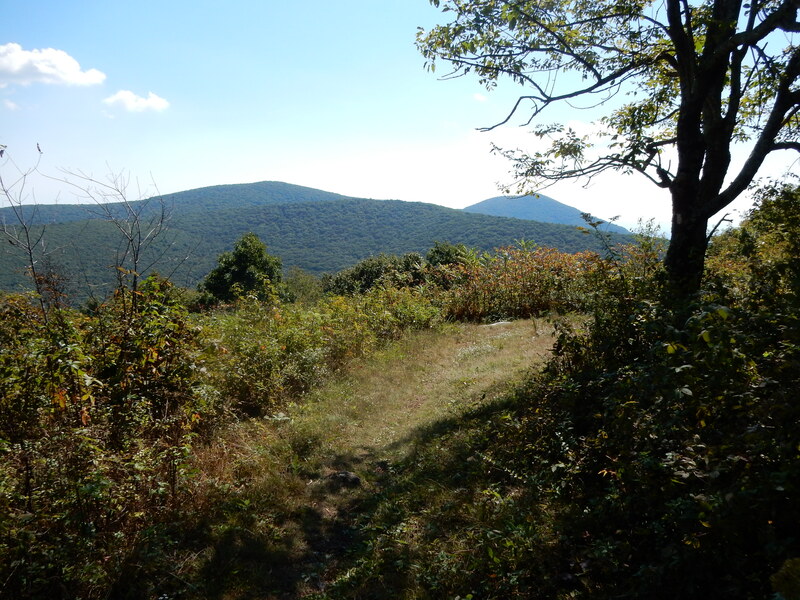 On our ascent, we encountered a woman with a melodious southern ascent who assured us that Cole Mountain rewarded its climbers—that it was like that hill that Julie Andrews climbed in The Sound of Music that inspired her to break out in song. 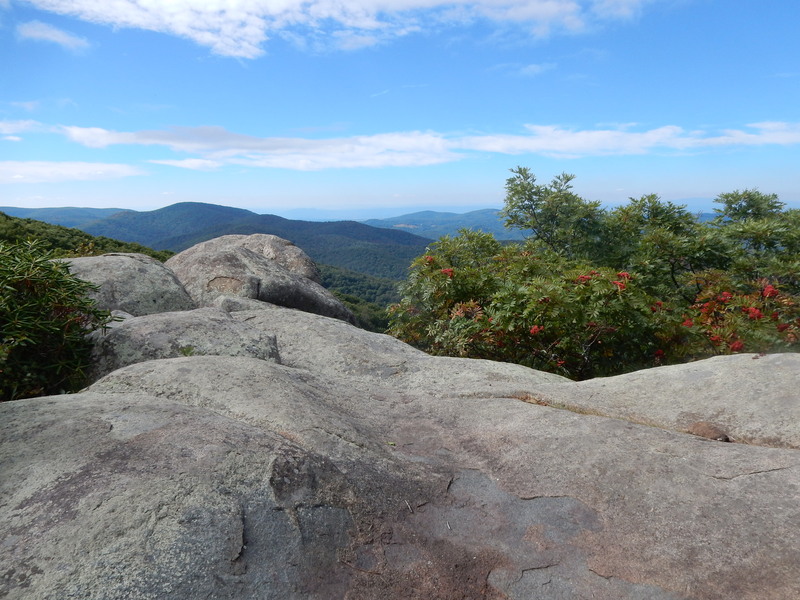 Well, Cole Mountain did, indeed, have a wonderful panoramic view (not quite 360 degrees, but still rather impressive for a hill—not quite as majestic as The Priest). We did not sing, not that we did not want to—perhaps, we were out of breath. A little ways south, we encountered a father and son team who volunteered to take our picture. Finally, we arrived at Cow Camp Gap Shelter and discovered that the spring was flowing. Once again, we had carried extra water unnecessarily. The good thing about it was that we had no need to filter water. We had plenty of water to spare. As there was a small family inhabiting the shelter and playing their music, we decided to hike further down the creek. There we found good tent spots and quiet. Todd, the surfer dude that we had met at Seeley-Woodworth, had made it here before us, but there was ample space, and Todd hardly made his presence known. We awoke in the middle of the night to rain. By morning, everything was soaked, especially (for some reason) the inside of our tent. Birch was kind enough to get up and make coffee. After warming up with the cup ‘o Joe, we decided that the best thing to do was to eat a power bar and get moving. We packed up quickly and put on a bit of rain gear. However, by the time we went the 1/2 mile back up to the AT we decided that wearing the rain gear wasn’t worth it. We were too hot! 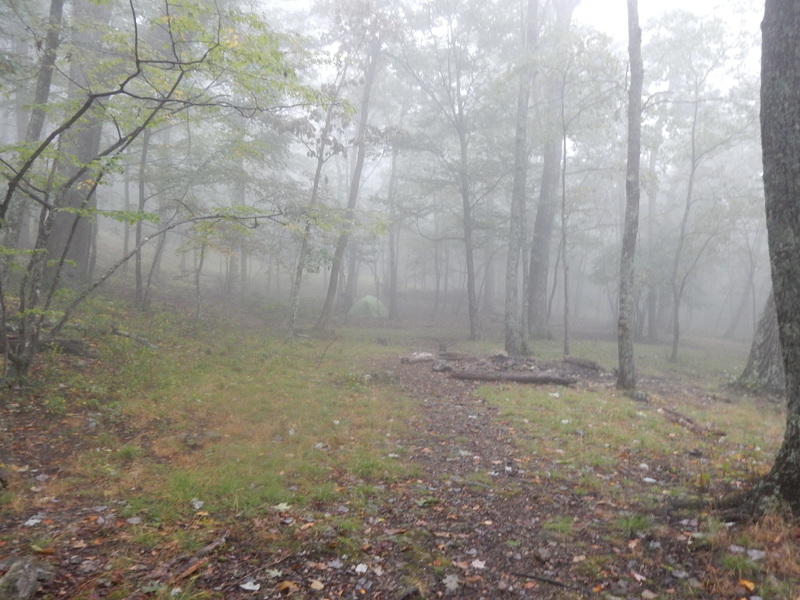 The fresh, cool, rainy weather was just what we needed to ascend the 2 miles to the top of Bald Knob. There are no overlooks here, which is just as well since we were fogged in. The descent is long (over two miles) and steep (a 2000 ft descent.) We made great time and were back to the car well before noon. US-60 has plenty of parking and the wayside was full of cars, many with AT bumper stickers. I guess it is a popular spot. I can’t wait to get back here for our next adventure, as we continue south on the trail. 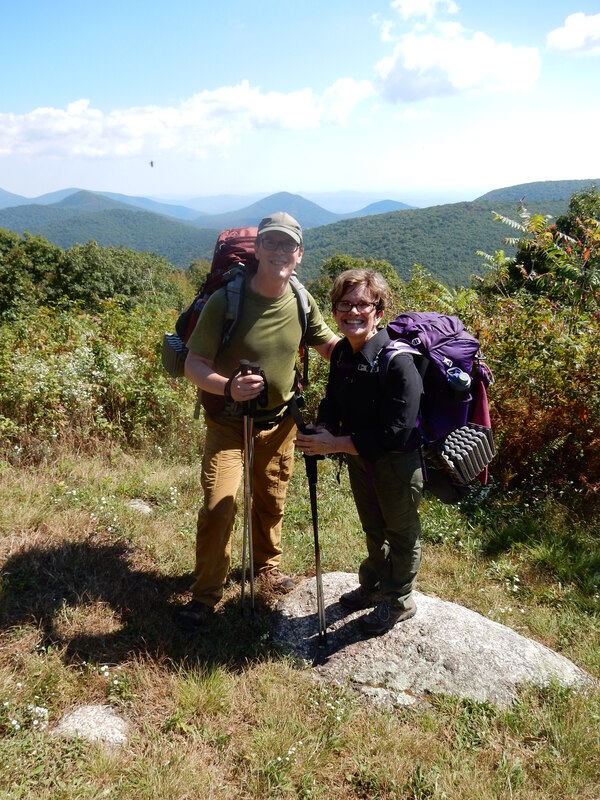 This entry was posted in Birch's Jots on Jaunts, Blue Ridge Parkway, Maple's Jots on Jaunts, Virginia Hikes and tagged A.T., Appalachian Trail, Backpacking, Cow Camp Gap, nbatc, Seeley-Woodworth, Spy Rock, The Priest, Virginia, virginia hikes by Birch. Bookmark the permalink.